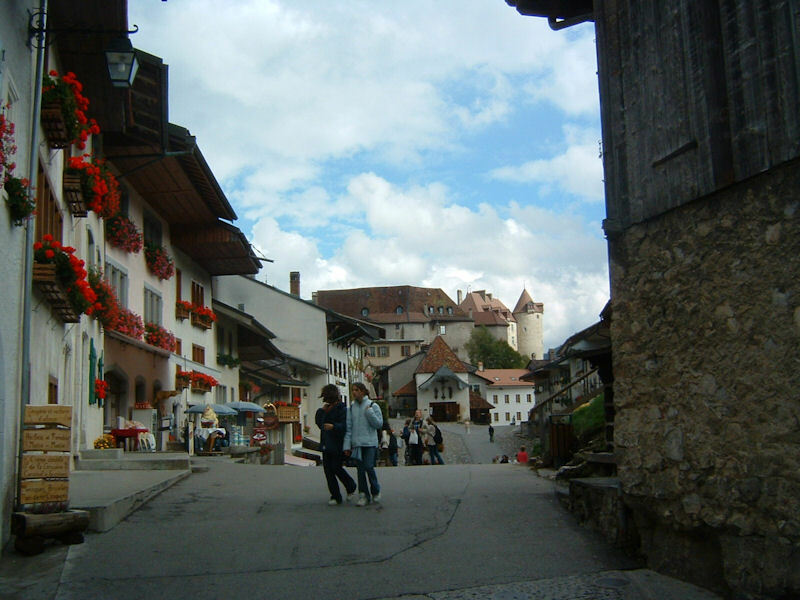 Gruyères, a fine old village-with-castle perched on a little hill in central-western Switzerland -- way too many tourists, sometimes, especially in summer, but they're the reason we've still got anything left at all, so let's keep welcoming them along and wait till October for our own visit. And here, indeed, we find ourselves, in October 2003, just us (Satoki, Alison, and Dwight) and an enormous crowd of schoolchildren out on the schoolbus for a Treat. 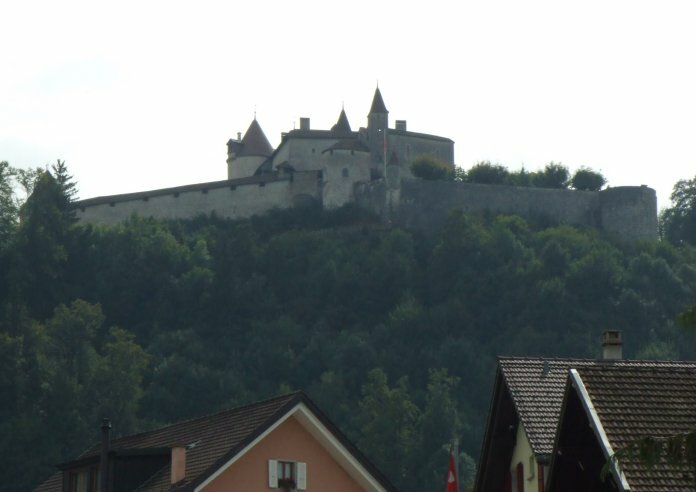 There's the castle at the end of the single hilltop village street, just ahead of us -- actually, TWO castles, first St. Germain and then Gruyères. 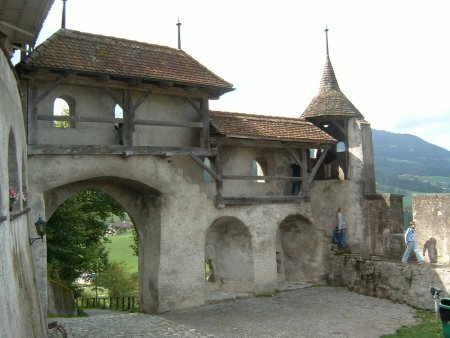 Gruyères, originally a family-owned town and castle (with 19 counts from the 11th to the 16th centuries), claims some prominence in the great Swiss victories over Burgundy in the 1470s. 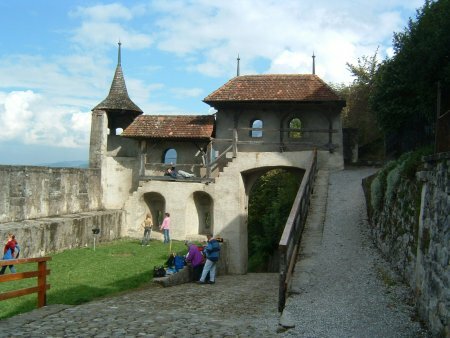 The castle served as administrative buildings for Fribourg from 1554 to 1849 and was then a private residence until the canton of Fribourg established the modern museum in 1938. 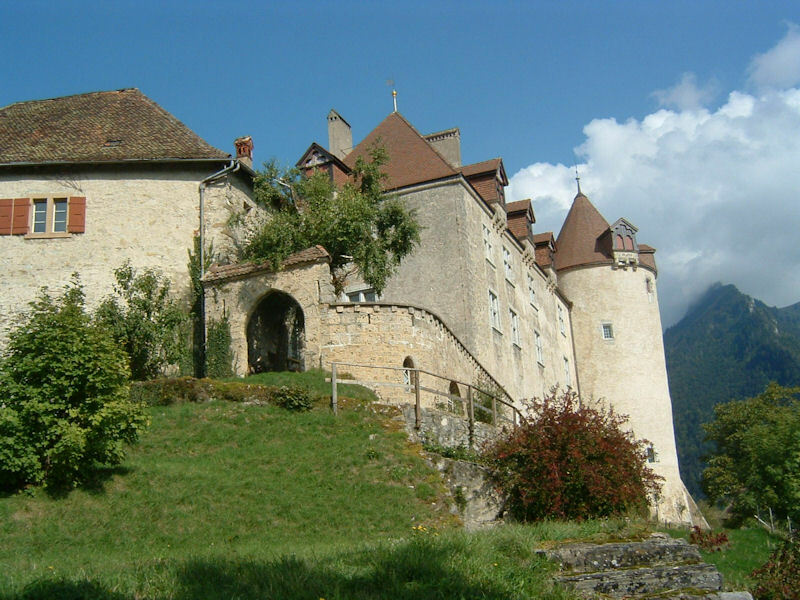 It resides just south of Bulle at the edge of the Swiss Plateau of the cantons of Vaud, Fribourg, and Berne, just where they meet the mountains of the Préalps. 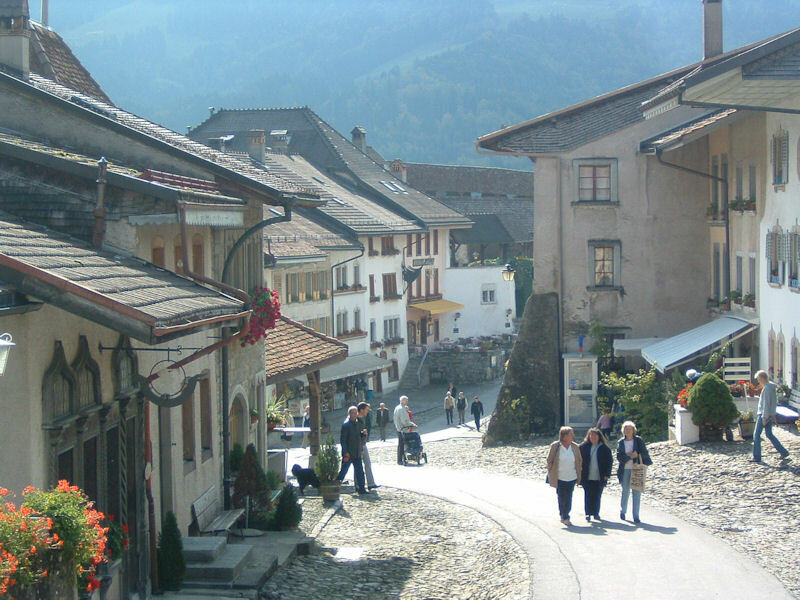 (The Moleson, right, at 2000m, hovers just 1200m above the village [stolen picture].) 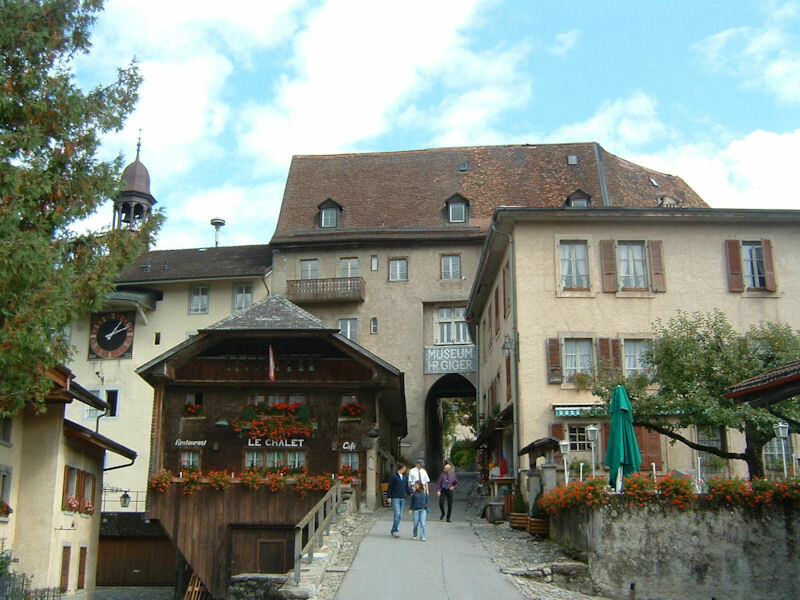 The mighty River Sarine flows out of the mountains just past the castle here and on to the brand-new Lac de Gruyères, and eventually to the Rhine near Bâle or Basel. 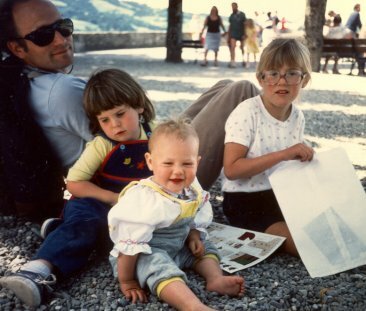 Traveling from Gruyères back up the valley of the Sarine takes you past Montbovon, Château d'Oex, then up into the heart of central Switzerland past Gstaad, Zweisimmen, Spiez on the Lake of Thun, and then Interlaken as well, eventually to the Lake of the Four Forest Cantons. 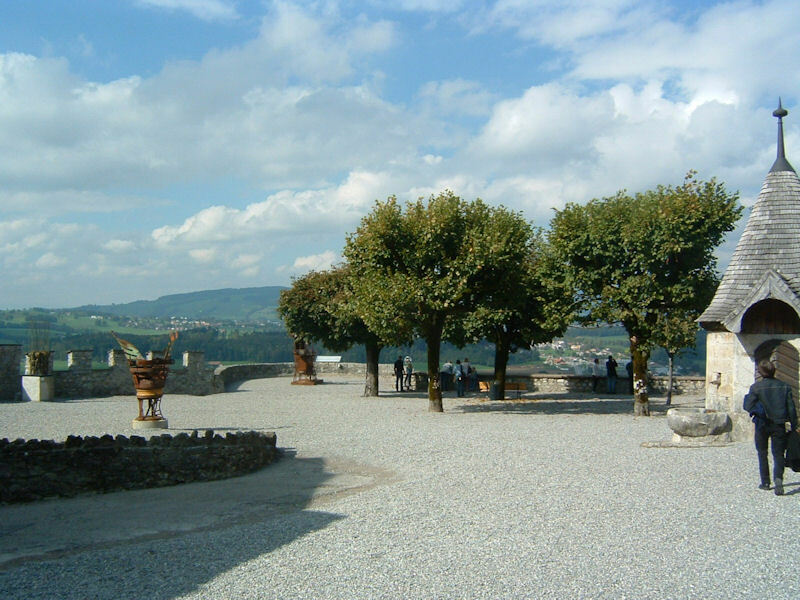 Then Liechtenstein. 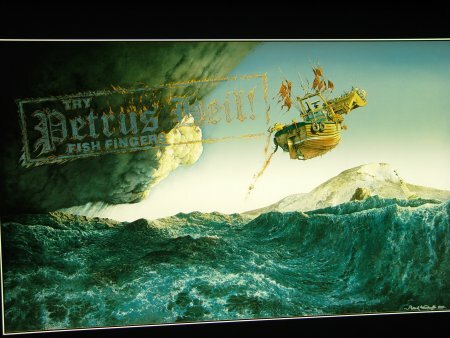 Then Austria. The Slovak Republic. Moldava, Belarus, etc. 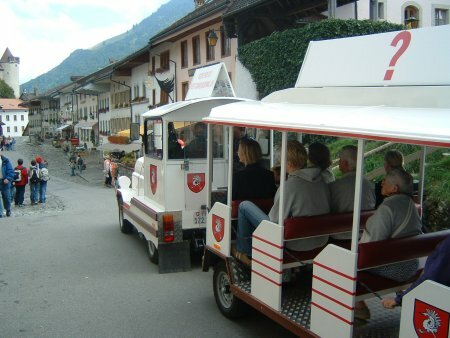 An innovation since our last visit -- A TRAIN so you don't have to walk all about to see the sights! Splendid! 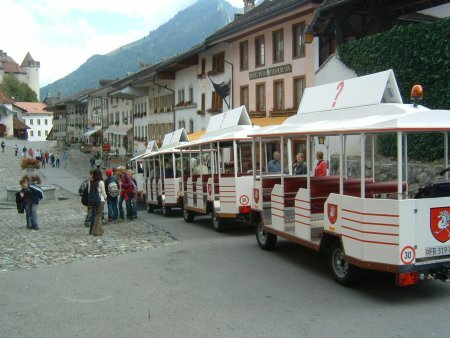 The village is only one street about 150 meters long, but this cool train will save you the effort of walking back and forth along it AND take you down to, and back up again from, the cheese factory/museum in Pringy at the bottom of the hill. The cheese factory near the rail station, which was extremely interesting but hell on the nose in the old days, has in recent years been renovated into a very modern and somewhat less offensive cheese experience, instructive and, if you don't harm yourself by pigging out, well worth the time. 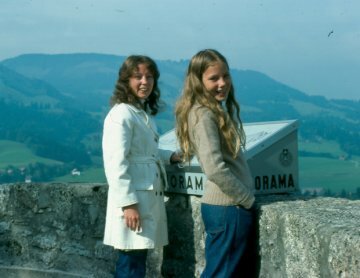 Schoolkids counting their change, as they always do, borrowing from one another for a last postcard and a specialty Gruyères meringue. No want of establishments here offering fondue, meringue, and strawberries with Gruyères cream on top at prices that, elsewhere, might buy you a small automobile. 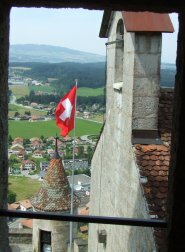 The white crane on red background in the banner above left is the emblem of the village and the old dukedom -- the name Gruyères is a variant of "grue" (the bird, the big hoisting machine, and a prostitute). Fans of fondue may be interested to learn that, whereas specialists would not normally be found in the same room with a fondue that did not have four cheeses in it (for example, 1/3 Emmenthaler, 1/3 Gruyères -- both hard cheeses -- and 1/3 a combo of two soft cheeses, such as Vacherin, Tilsiter, Appenzeller, etc. 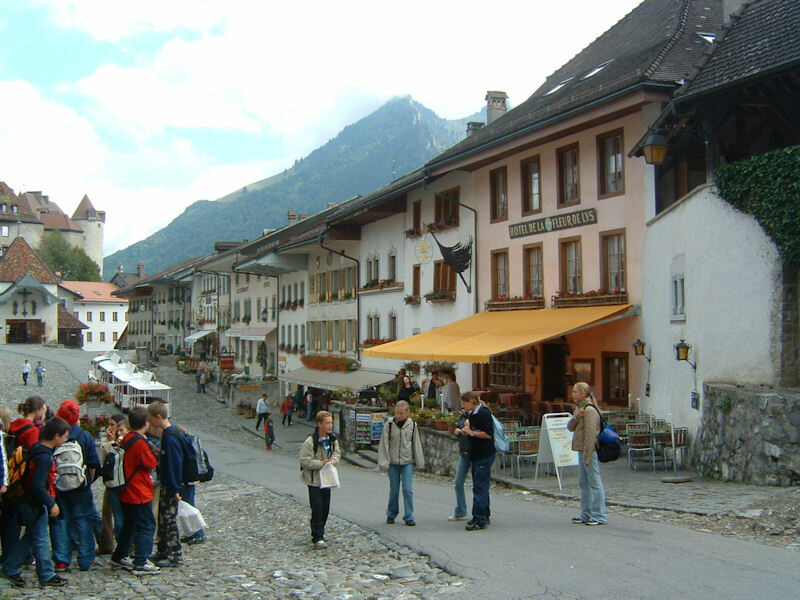 ), real Fonduistas have frequently been seen grinning in the Gruyères train station in Pringy (the buffet de la gâre) over a solo Gruyères fondue or a moitié-moitié, half Gruyères and half anything else. 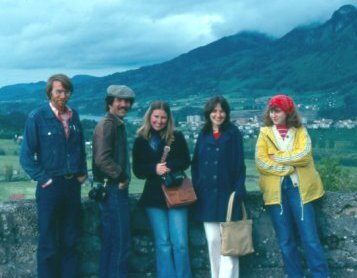 And of course, as with any good fondue, the exquisite tastes are increased many-fold if you've got to them by hiking rather than on a crowded tour-bus. Similarly, the ponderous weight in your lower-middle is much increased if you're going back home again with everyone else on the same crowded bus, perhaps with awkward noisy accompaniment. 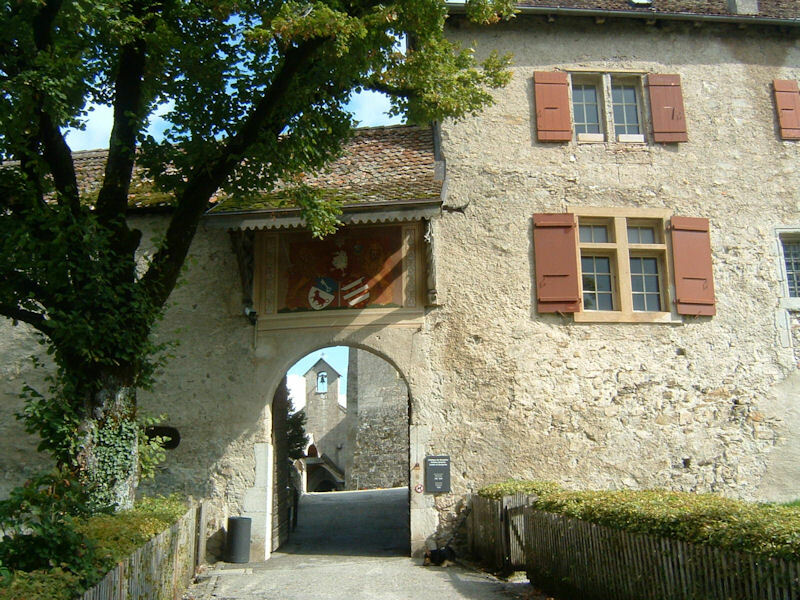 The ramparts and gates at the northeastern side of the village street, with schoolkids cavorting. 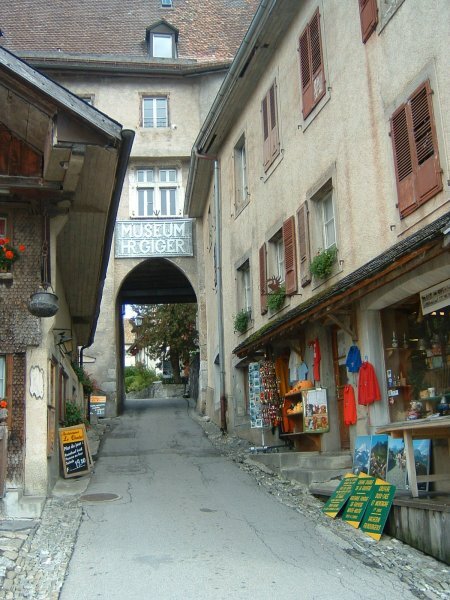 Trotting briskly along towards the Château de Gruyères at the top end of the village, we pass first through a gate in the Château St Germain, which now boasts, since 1998, the museum of the freaky art of H. R. Giger. Mr Giger had something to do with the Alien movies and specializes in fantasy-sci fi aliens and furniture, and here he is in his glory, with many of his original works in the museum on the right and, newly, a bar, with Alien furnishings, on the left where a giftshop used to sell coffee mugs with the Swiss flags on and cowbells. 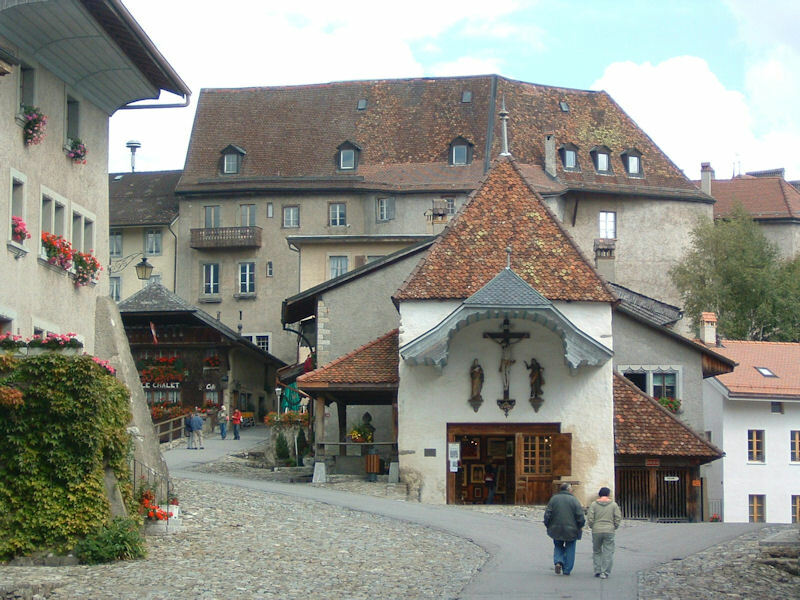 Left: The tourist shop on the right specializes in miniature Swiss cowbells and the restaurant on the left, in fondue, but once we pass under the arch we're in Giger land. 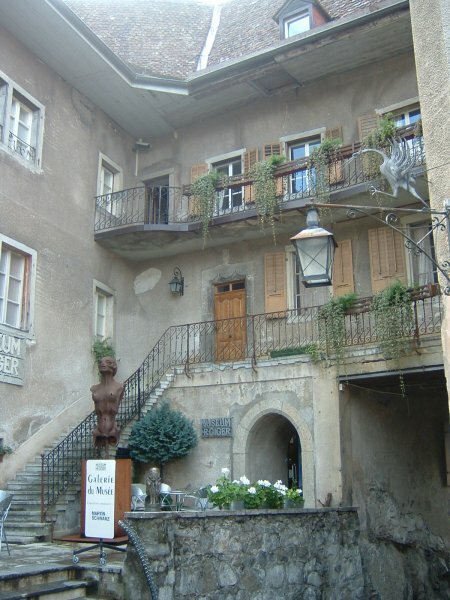 Right: Part of the Giger gallery. 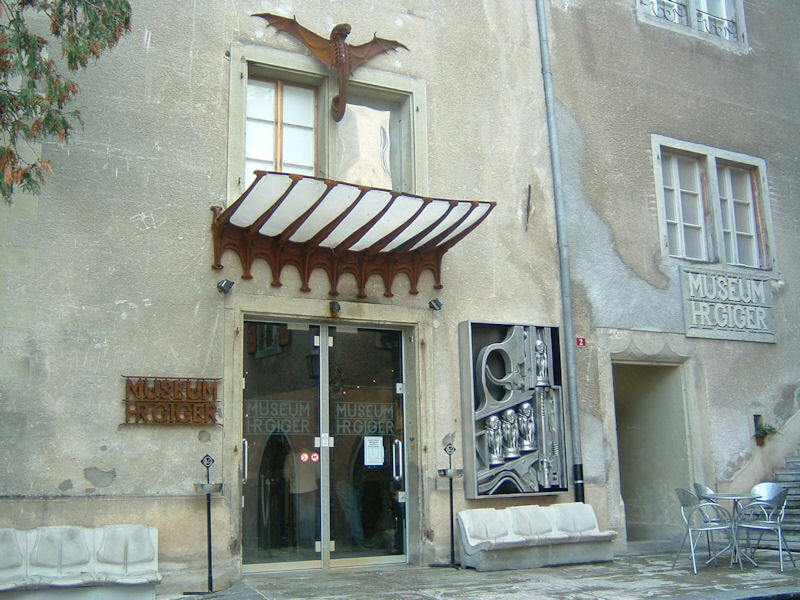 The entrance to the H. R. Giger museum. Strange stuff: technically very well drawn and crafted, imaginatively very freaky and creative, sometimes thought-provoking in a way, and always nasty and off-putting. And definitely not what we came here for. 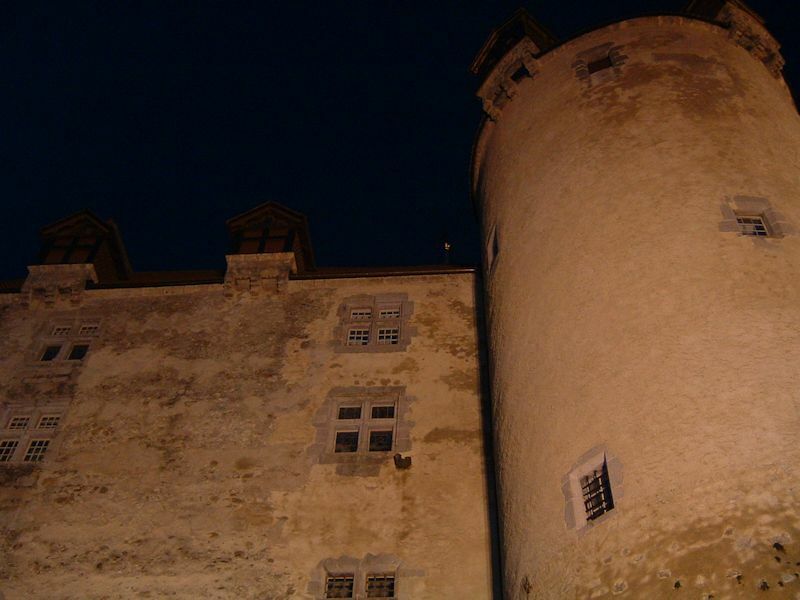 Here's what we came here for: the great late-medieval pile of the Château de Gruyères. The castle itself seen from the esplanade inside the gates. 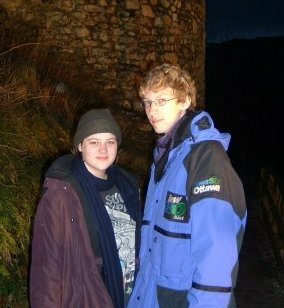 Not a very nice photo itself, but it gives you a sense of the lay of the land. 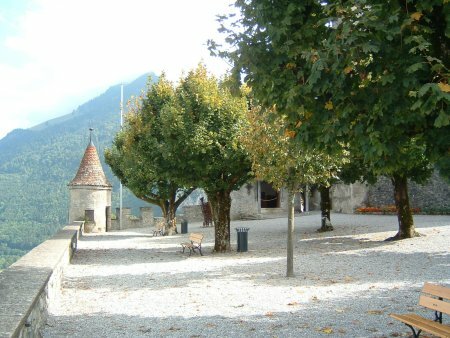 More of the esplanade in front of the castle, and the dinky little chapel. Gazing down from the esplanade at cute little Epagny 115m below. 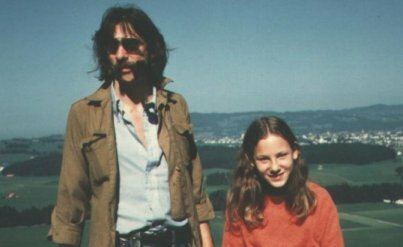 Mr Peck used to run frequently from Leysin to Gruyères over the mountains and regularly shuffled through Epagny after about five hours, bound for the castle looming above, drooling in a state of delirium. 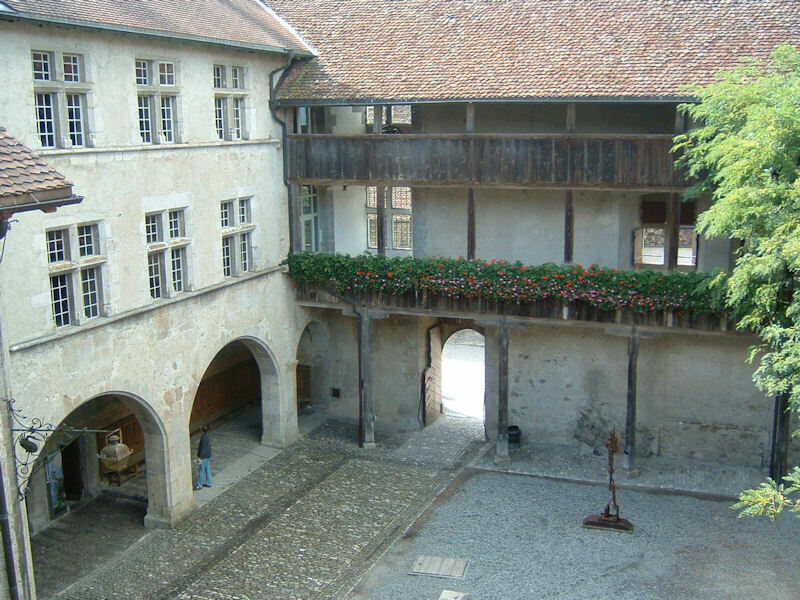 Passing into the courtyard of the castle proper, we find a small but homey arrangement of main buildings (left) and outer wall. 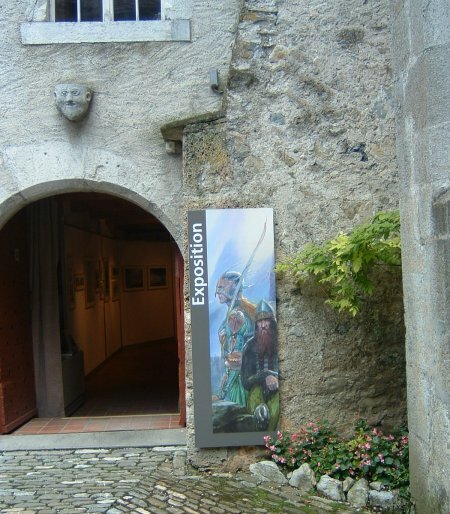 Galleries in the main buildings have for years been hosting displays of fantasy art works, and newly a narrow tower in the outer wall on the right has also been acrobatically converted into a four-story display constructed all up and down a spiral iron staircase up the center. 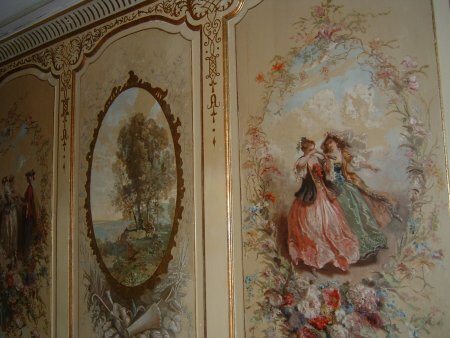 Great fantasy art it is, too, but the more fantastical because you need to hang half off a narrow spiral iron staircase with white knuckles to see any of it. 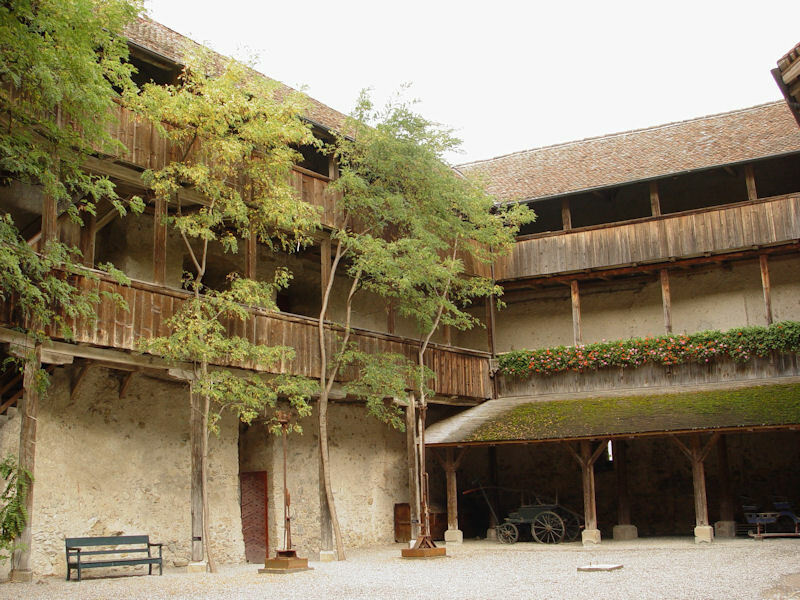 A warmer, homier look to the inner courtyard than the photo above, because Alison's digital camera cost about five hundred francs more than mine did. 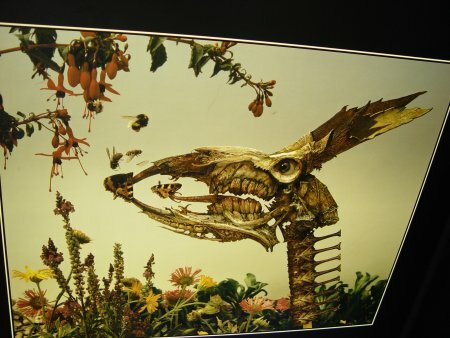 And here's a bit of the other exhibition, Patrick Woodroffe, all stretched down the inside of four stories of the narrow tower (that's why all the angles are wrong in the photos). Like them or not, these paintings invite long scrutiny and reflection, and looking at them from an iron spiral staircase in a narrow tower with tourists above and below you trying to get past you cannot do them even Guatánamo justice. 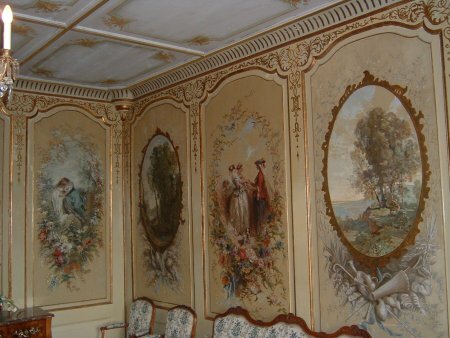 Different art -- late 18th century scenes on the walls of the drawing rooms, executed by famous friends of the castle owners at that time, the Bovy family. The kids' bedroom is even cuter (no photos here), with happy little squirrels and songbirds all over the place. 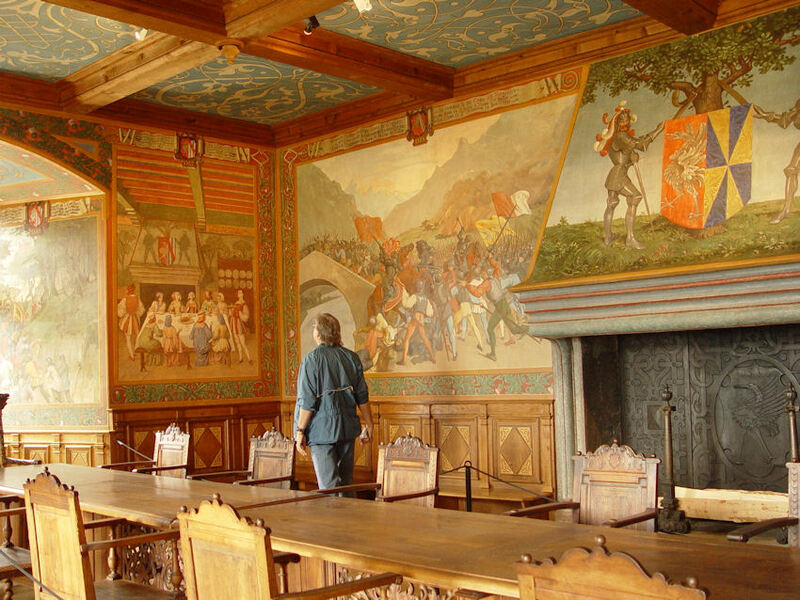 That's me in the great hall, somberly reviewing the history of the castle owners' interactions with regional history in epic illustrations all around the room. Not the greatest art, but there are hours of fun in picking out the strange little details and trying to remember enough Latin to get a general sense of what's going on. 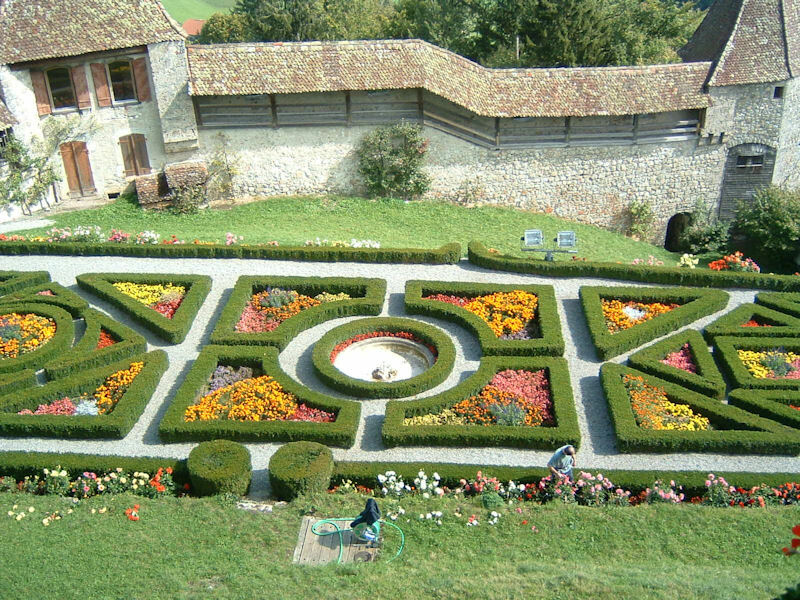 The gardens at the end of the castle, seen from the hall above. 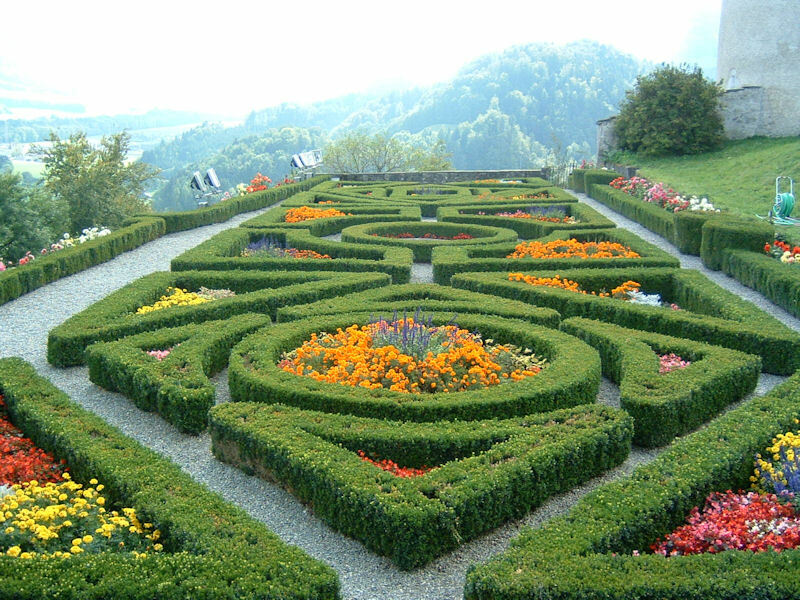 And the same gardens, seen from the gardens. 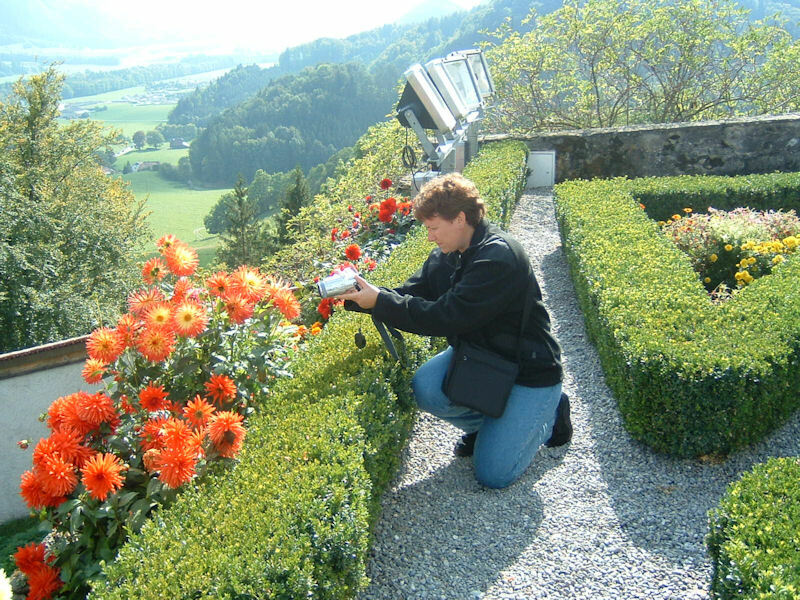 Dr Alison B. Peck, photographing flowers in the same gardens, the River Sarine in the distance. And back up onto the castle esplanade, where six centuries ago the guardsmen kept fit by battering one another with wooden staves and knights' horses pooped all over, we see still more fantasy art, in this case freaky iron sculptures, many representing implausible outer-space vehicles with a medieval theme. 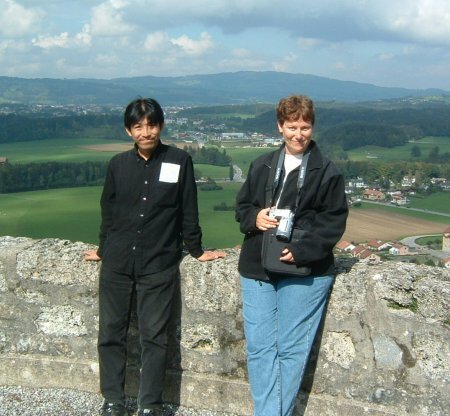 Here on the esplanade in October 2003, overlooking the Swiss plateau towards Bulle and Fribourg and beyond, we find the narrator and daughter Alison (left), and astrophysicist Satoki and Alison again.
. . . the narrator Dwight and daughter Alison some years ago in precisely the same attitude and place, but without Satoki. . .
. . . and (left) Alison's mom and Alison herownself in 1977, and (right) former-roommate Lowell, Charlie, Cathy, Sheila, and Alison, similarly in the same place, in about 1979. 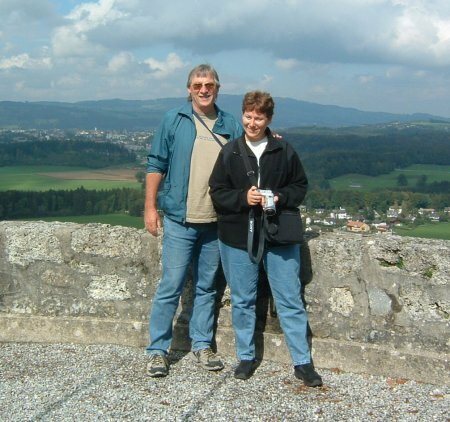 And now back to 2003, we're leaving quaint Gruyères without having spent a dime on meringues or solo-Gruyères fondues or strawberries and Gruyères cream (just a 5 franc croque monsieur that took 15 minutes to get cooked up). 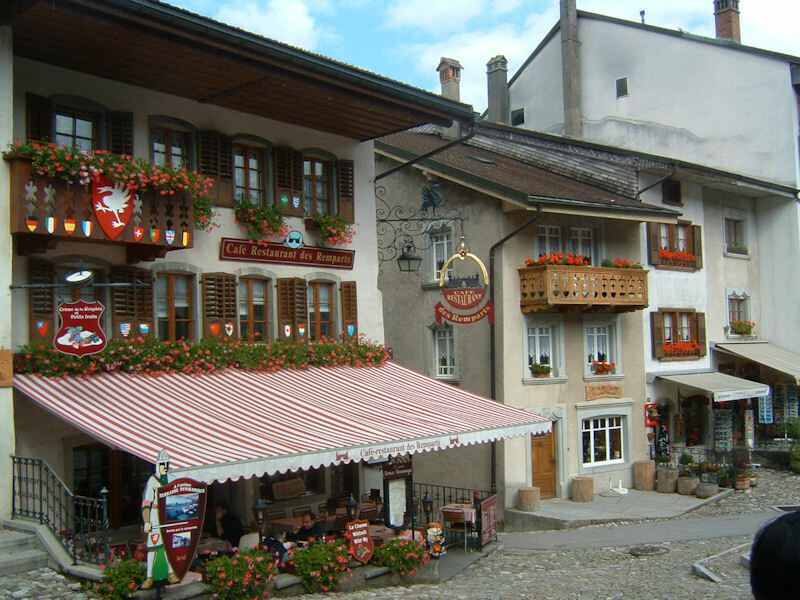 Gruyères can be a very touristy place, in the right season, and there's a good reason for that: it's a wonderful place to visit, except for the tourists. 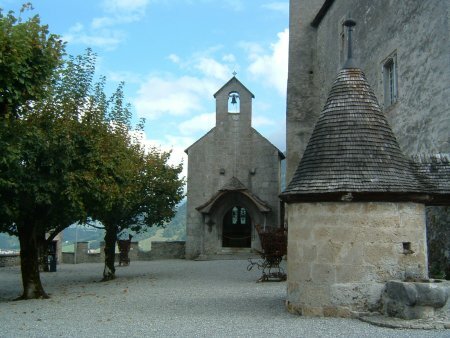 Just passing through, driving towards the Pays d'en Haut, September 2006. This is from the roadside on a grey day, coming from Bulle to the north. 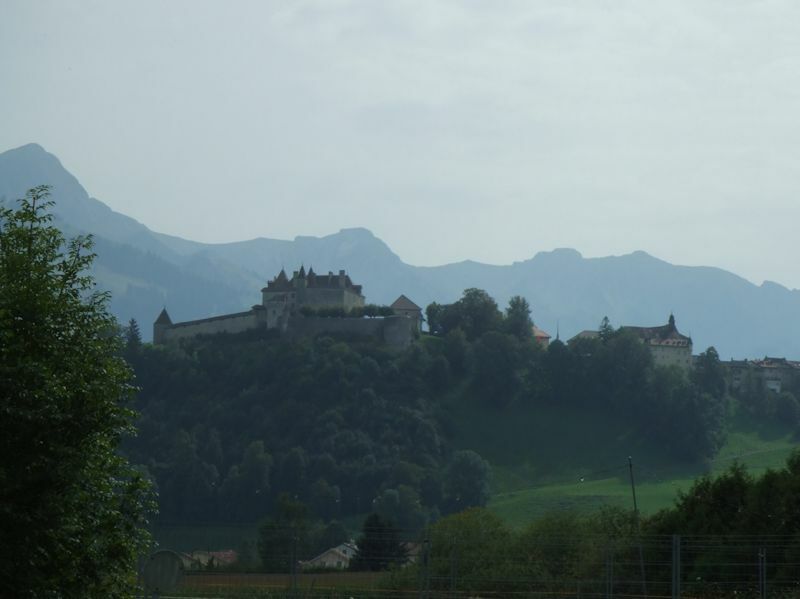 The castle looms on the hill, and the walled village of Gruyères runs down towards the right. 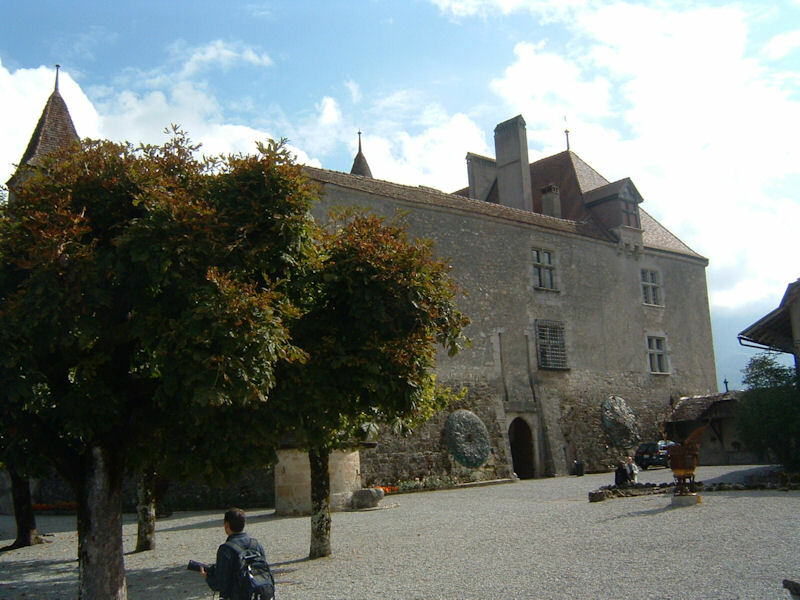 The château overlooking the village of Epagny at the foot of the hill. 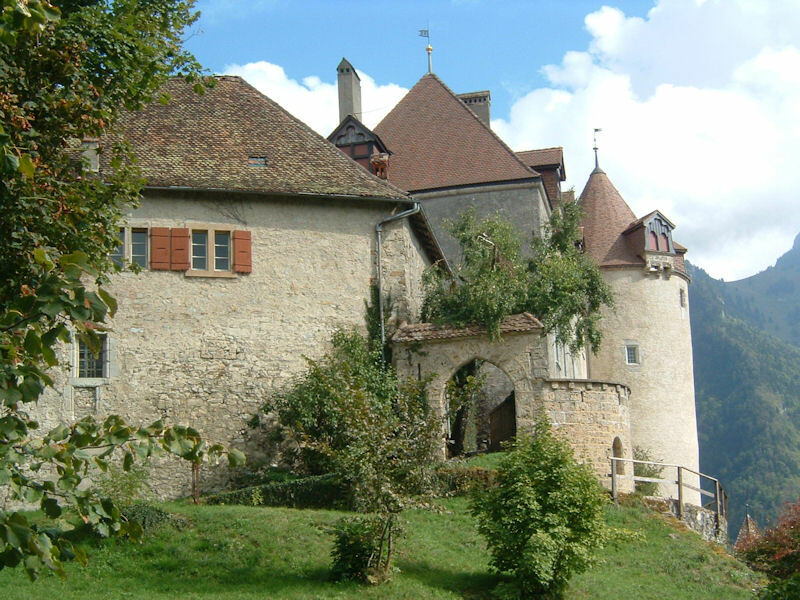 The Château de Gruyères from the south, near Enney on the mighty river La Sarine. 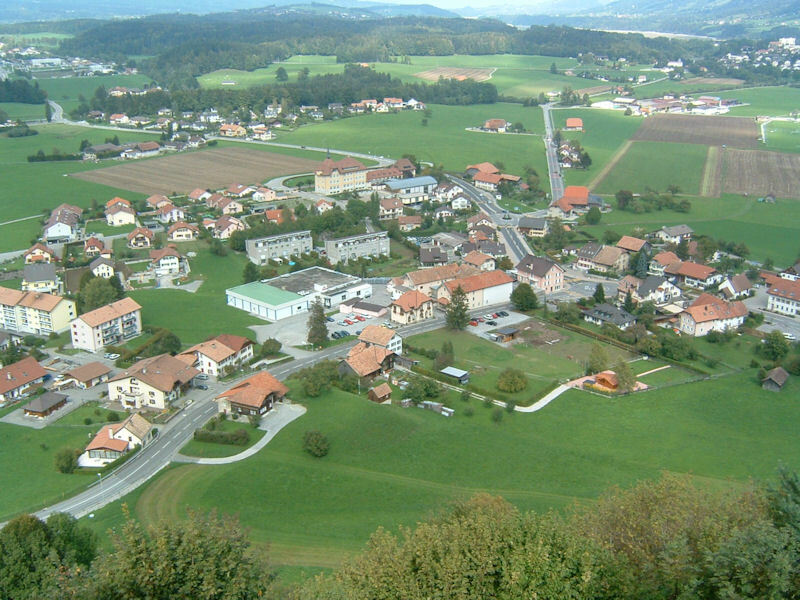 The road across the lower part of the photo leads out of the Pays d'en Haut (left), from Interlaken and the Lake of Thun past Zweisimmen, Gstaad, Château d'Oex, and Montbovon to go out (on the right) onto the Swiss Plateau near Bulle and Fribourg. 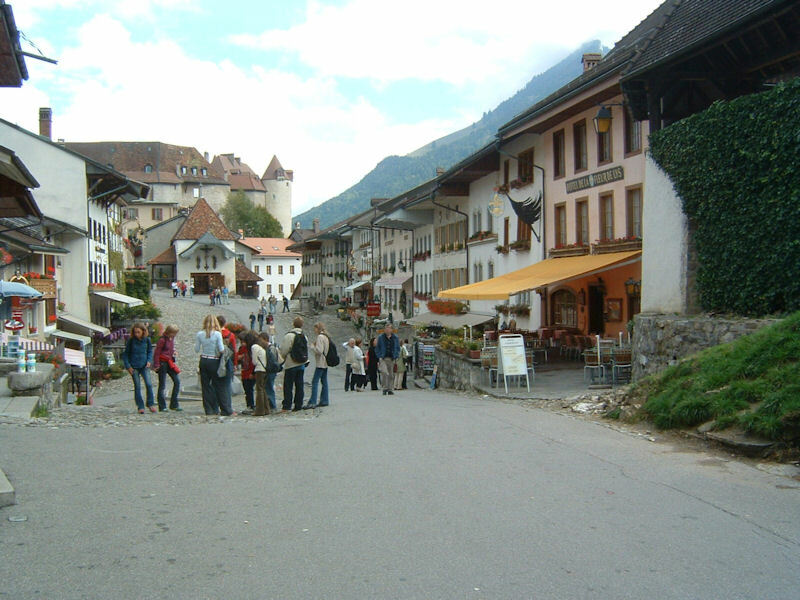 The inhabitants of the valleys between here and Thun and Interlaken have resolutely fought off all attempts to put a major motorway up the valleys. So the traffic can be brutal on Sunday evenings in the ski season. But this is 25 September 2006, and there are no cars at all. Feedback and suggestions are welcome if positive, resented if negative, . All rights reserved, all wrongs avenged. Posted 28 November 2003, revised 29 September 2014.